Researchers from Chiang Mai University show off the prototype “wildfire starting drone”, which is designed to start a controlled fire in inaccessible areas by dropping a chemical mixture in arid deciduous forests. MOVES TO control smog in the North are ineffective since the authorities are only focusing on controlling outdoor fires, experts cautioned yesterday. With summer approaching, people in the North are now bracing for the annual seasonal haze, which normally begins in March, though academics and local experts believe that issuing a two-month ban on outdoor fires is not really an effective solution. They also pointed out that the prevention of forest fires will do more harm than good to the arid deciduous forest’s ecosystem. 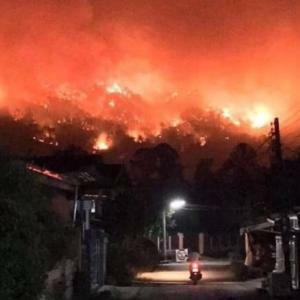 Watcharapong Tachajapong, an assistant professor at the Chiang Mai University’s Faculty of Engineering, said at a seminar in Chiang Mai yesterday that imposing a strict ban on outdoor fires was not enough to control the pollution from PM2.5 fine particles. More has to be done to cut down emissions from other sources, he said. “The North has been suffering from severe air pollution during summer since 2007, and we have still not been able to solve this problem,” Watcharapong pointed out. 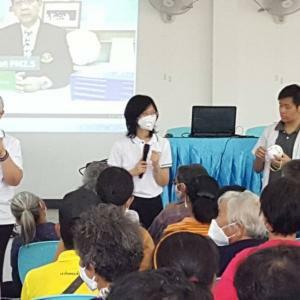 “Initially, Chiang Mai authorities and residents were very active in looking for the source of pollution and coming up with mitigation measures, much like the reaction in Bangkok. However, after a few years, these measures shrank to a two-month ban on outdoor fires,” he said. He pointed out that the only way to cut pollution was to address the problem at its different sources, especially in the transport and industrial sector. According to the Land Transport Department, Chiang Mai – the second largest city in Thailand – had the second highest number of cars in the country with 315,670 registered as of the end of 2017. Meanwhile, Chiang Mai’s neighbouring province Lamphun has three industrial parks. Data from Industrial Works Department shows that as of 2014, there were more than 18,000 factories in the North. Tan Kalawin, a village headman in Chiang Mai’s Chom Thong district, said that though locals have been following the ban on outdoor fires for many years now, they have found that not only is it impossible to prevent wildfires, but that these fires now are even more powerful and devastating. “If we get rid of dry leaves before the wildfire season, then there is less flammable material on the forest floor, so less fuel for a serious wildfire during the summer months,” Tan said. This year, the ban on outdoor fires for nine provinces in the North will kick off in Lampang from February 10 to April 10, followed by Nan, Phrae, Phayao and Chiang Rai from February 15 to April 15. The ban in Chiang Mai, Lamphun, Mae Hong Son and Tak runs from March 1 to April 30.